When my daughter-in-law to be asked me if I would make their wedding cake I was only too pleased to accept. I had never made a wedding cake before but considered it couldn’t be too difficult. A fruit cake, some marzipan and some icing. I’ve made a Christmas cake before, not much difference really just three or four times as many tiers. Then Karla said she wanted a ‘naked’ wedding cake. Well, I had never heard of a naked wedding cake so I quickly jumped onto Google to check for some pictures (there weren’t all that many – but enough to show me what they were about). 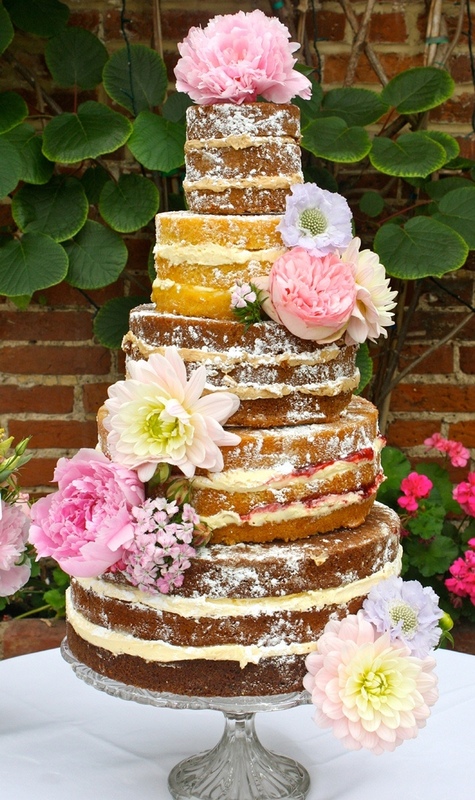 So I discovered pretty quickly that a ‘naked’ wedding cake, kind of logically, has no marzipan, no icing, just raw sponge cake with some creamy filling and some icing sugar and flowers or fruit. We both searched the Internet for various styles and Karla came up with one that she particularly liked. Very rustic and raw looking with some pretty pink peonies. This looked very do-able and I felt buoyed and excited by the challenge ahead. I had over 12 months to plan the cake so no panicking necessary. I started by reading up on what would be the best type of cake to use. I decided that Madeira was ideal as it would keep for a few days without being refrigerated and it is a pretty basic recipe with simple ingredients. I visited a local cookware shop with the bride-to-be and she made a decision on how many tiers would be required and what size cakes would be the best. While I was there I bought myself a cake slicing wire so that I could have a practice cutting a cake into three pieces. This could always be done with a long knife, but I wanted to be sure to do it evenly. 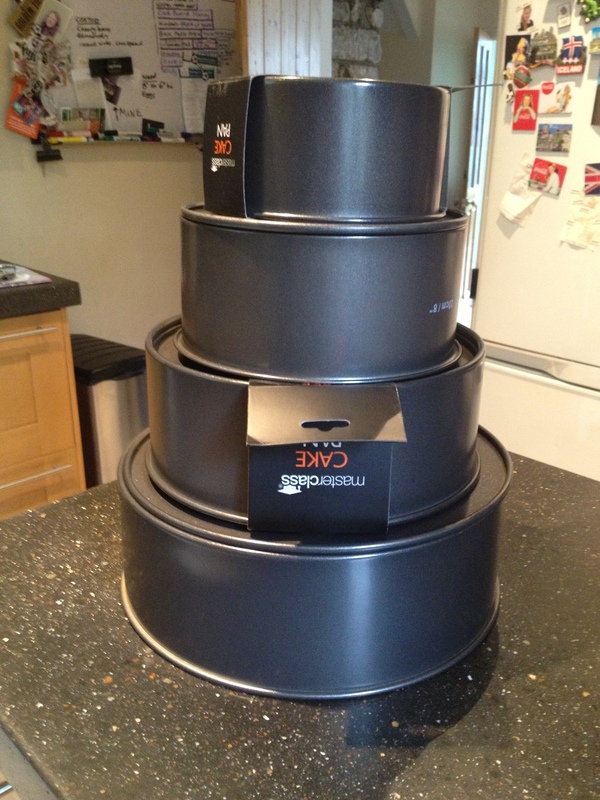 I already had a couple of cake tins that would be great for my practice cakes, though not exactly the right size. My first attempt was in November 2013, I made a Madeira cake from a great recipe book that my husband bought back in the early ’90s when he started making homemade bread. The Good Housekeeping Complete Book of Home Baking has a great chart in it which allows you to work out how much of each ingredient you need for a specified finished volume of cake. 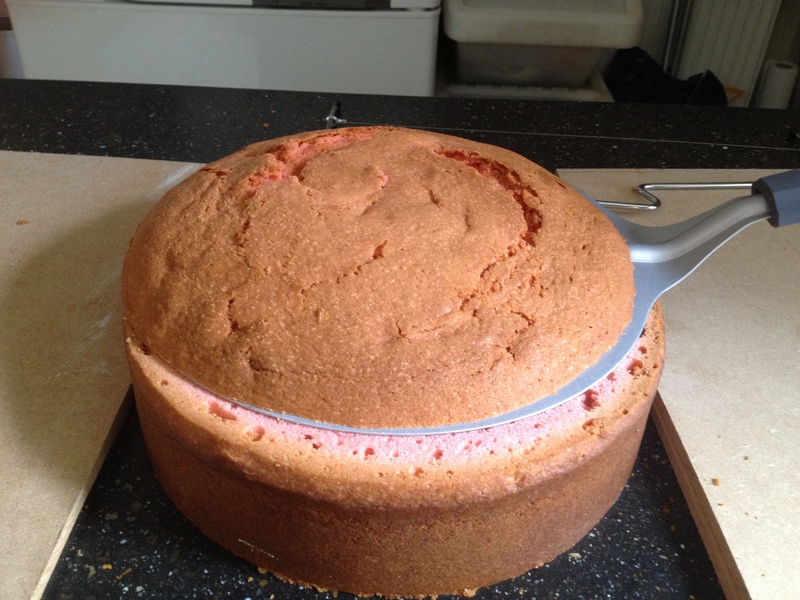 You just fill the tin with water up to the level that you want your finished cake, then measure the volume of water. Then you just look on the chart and find the recipe with the nearest liquid capacity. Its magic! I think Karla was happy when she saw the first attempt because she became slightly emotional:-) I just did the one layer and decorated it with icing sugar and some roses from the local supermarket which I had managed to procure for 20p as apparently they were past their best (although they looked perfectly fine to me). We had decided to use buttercream as the filling for the cake as this is easy to make and it also stores well out of the fridge – this was flavoured with vanilla. 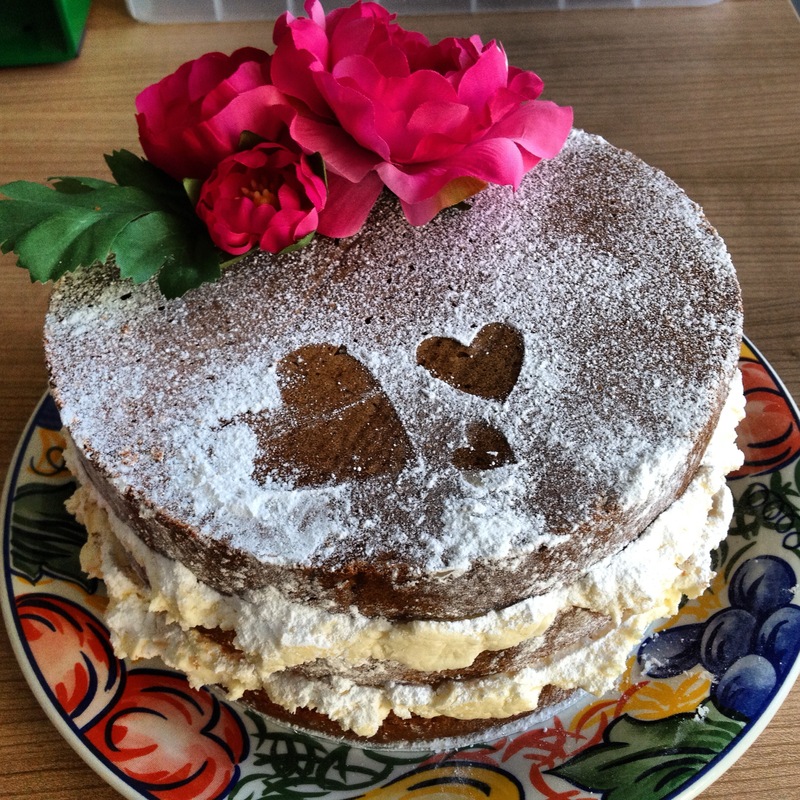 The first test cake went down very well with many cups of tea and coffee over the next couple of days. Several months went by and I made a couple of trips to the cookware shop, purchasing some of the tins when there was a 20% sale on and a cake lifter, to help me when building the cakes. Karla and I had discussed flavouring and colouring the cake but because this is a Madeira, the side of the cake was always going to come out brown. In order to get pink layers visible I would have to trim the sides. This would have resulted in the cake drying out and so we made the decision to colour two of the layers pink, even though this would only be seen once the cake was cut. 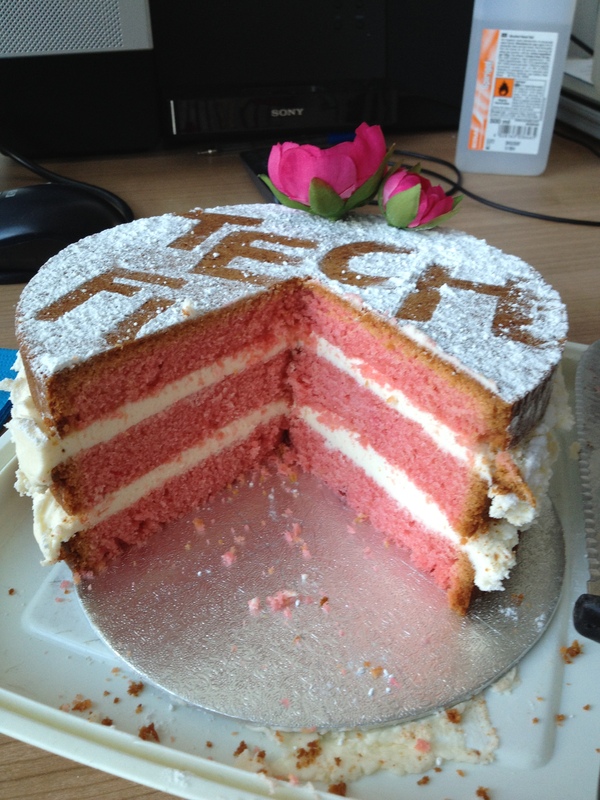 The pink layers would also have a rosewater flavouring as would their respective buttercream fillings. By June of 2014 I was almost completely set up to make all of the cakes, but felt I needed a few more practice cakes in the bag before I was completely confident. I also needed to have one attempt at placing one tier on top of another. My colleagues were in for a treat – they were to be the guinea pigs for my next couple of cakes, as were my friends and family and neighbours. I needed to test the recipes using rosewater and pink colouring. The first cake that I took into work looked great and the buttercream was oozing out of the sides. I wouldn’t let the hungry scoundrels cut it until after lunch and we all had a nice cup of tea or coffee! 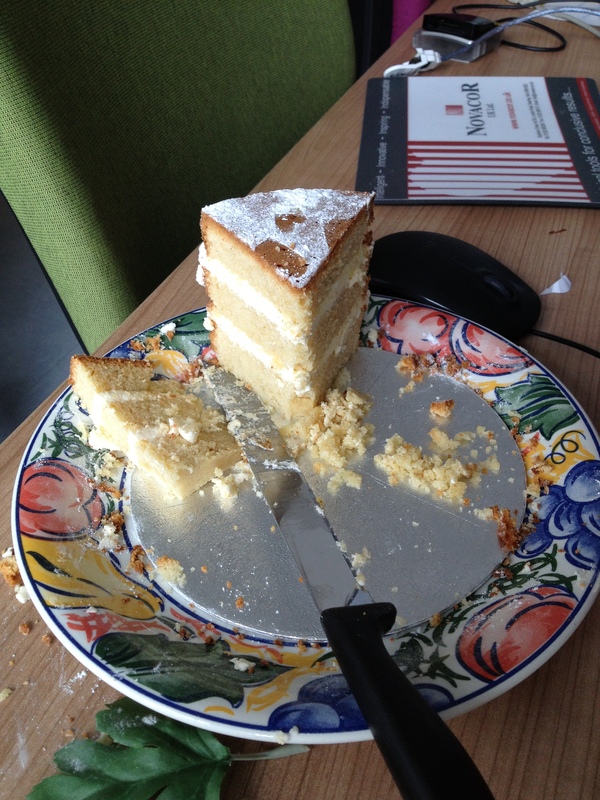 As you can see, quite a few colleagues turned up at lunch time and the cake didn’t last long! 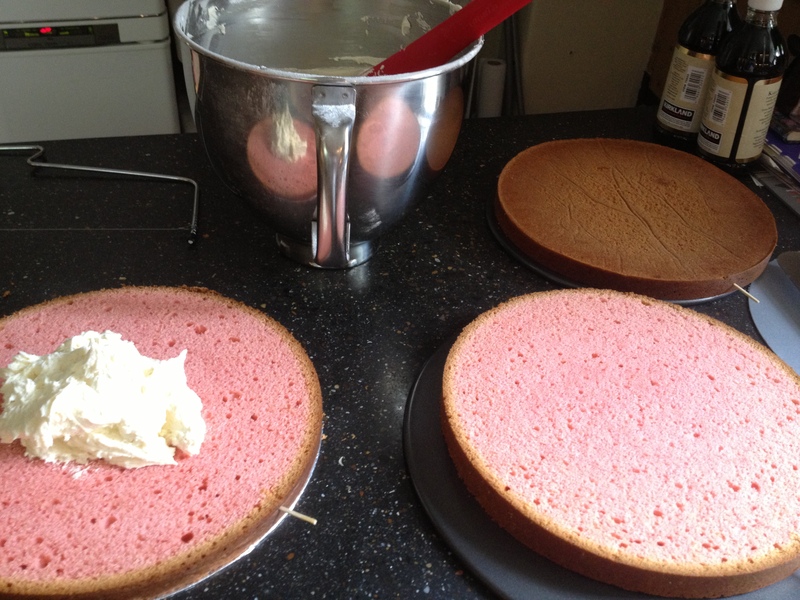 I didn’t want the cakes to be dark pink so I had to be very careful when adding the colour. Over the next couple of months I made 5 or six more trial cakes, these varied in size from the 6″ top-tier to the 12″ bottom tier. 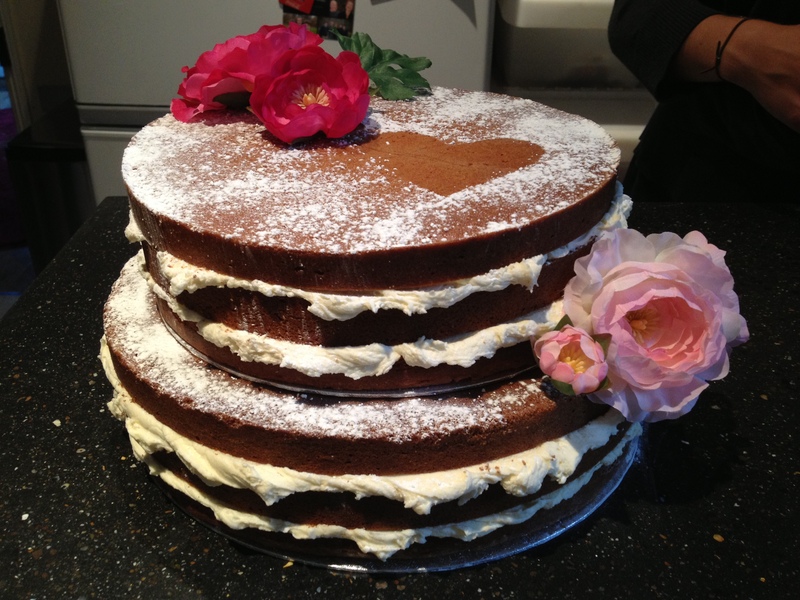 Then a couple of weeks before the wedding I made the bottom two tiers and practiced constructing the cake. After another visit to the very useful cookshop, I was set up with plastic dowels and cake boards. I bought cake boards that were slightly smaller than the cakes because I didn’t want them to show. A couple of weeks to go now. Finally I was going to make the large bottom two tiers – thank goodness for the cash and carry where I could buy very reasonably priced sugar, butter and free range eggs. 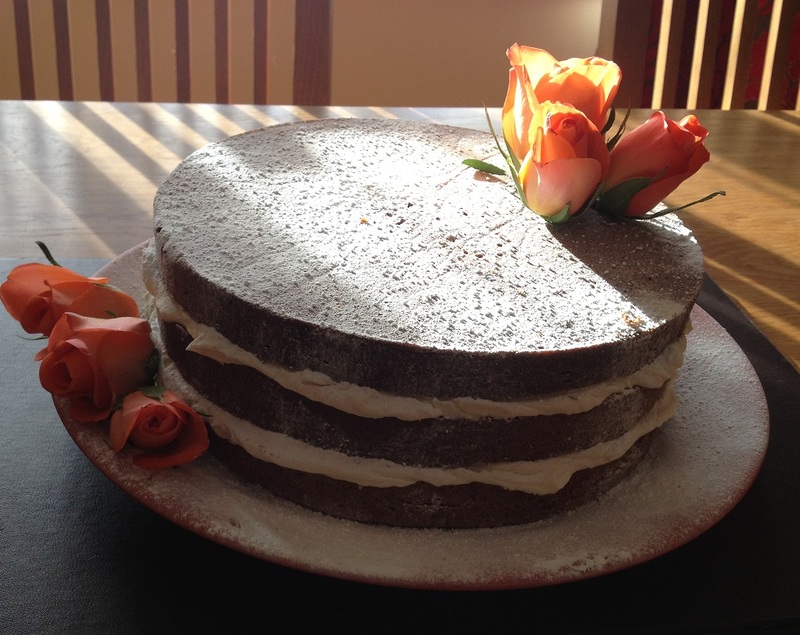 The 12″ cake used 14 eggs and 800g butter (see recipe). This was a very large mix that was just slightly too big for my Kitchen Aid, so I had to mix it in two batches then mix them together in a larger bowl. 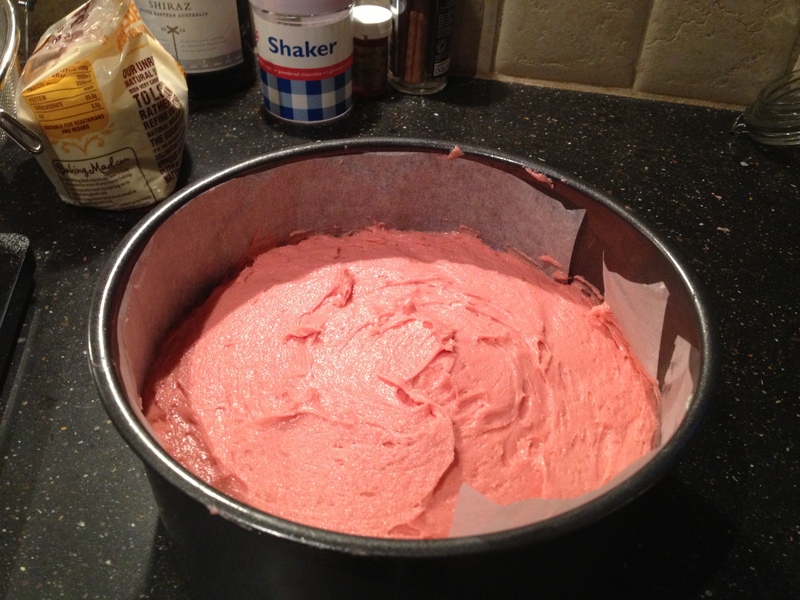 This was one of the reasons I wanted to practice the bottom tier – to see if mixing two batches together would matter. It didn’t. The Madeira appears to be a very forgiving cake. The two tier cake worked well. I cant remember who it was eaten by, but probably a combination of my ever hungry family and my very understanding work colleagues! Hi,could i make the cakes in advance and freeze them?